Port Elizabeth’s entry in the 1971 Cape to Rio Yacht Race was the 34 foot, Flame. The then 65 year old owner and skipper, Basil Weale hoped to complete the race in 30 days. 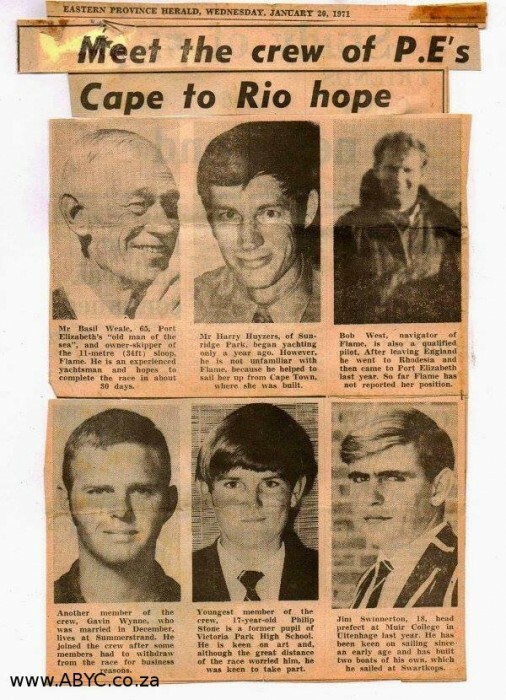 Jim Swinnerton, 18, former 1970 Muir Head Prefect and a keen Swartkops dinghy Sailor. The image and snippet of news below. taken from The Herald of 20 January 1971, comes from Frank Atkinson who says; “A lovely bit of old memorabilia to bring back memories – look at Gavin”. Can anyone shed any light on how Flame did? @MyPE I was just talking to Jimmy about the race this morning. Coincidence that I see your post now!